Vestax PAD-One: Another option for your laptop bag. Vestax's PAD-One managed to pass us by at BPM 2010, but it's well worth drawing your attention to. 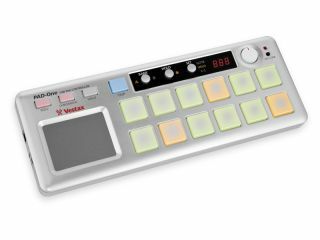 It's another mini MIDI controller to file alongside those from Korg and Akai, with 12 pads and an X/Y touchpad at its heart. No price or release date as yet, but we'll let you know when they're confirmed. In the meantime, check out this slightly shaky video from Vestax Japan.